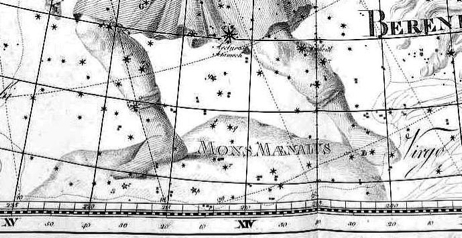 A mountain of Arcadia in the central Peloponnese, introduced as a constellation by Johannes Hevelius in his Firmamentum Sobiescianum star atlas of 1687, where it was depicted with Boötes standing on it. It appeared on many later maps, always as part of Boötes, and it never had an independent existence. The feet of Boötes rest on Mons Maenalus, as shown on Chart VII of the Uranographia of Johann Bode (1801). Click on the following link to see Hevelius’s original depiction, including a change of mind over the spelling of the name. The mountain took its name from a character in Greek mythology. Maenalus was said by some mythologists to have been the eldest son of Lycaon, king of Arcadia; this would have made Maenalus brother of Callisto and hence uncle of her son Arcas, whom the constellation Boötes represents. 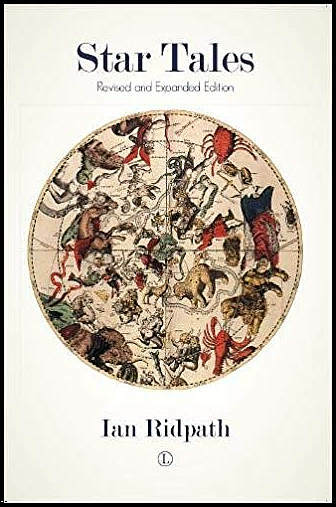 Others, though, say he was actually the son of Arcas and hence the grandson of Callisto. Either way, Maenalus gave his name to the mountain in Arcadia and to the city of Maenalon which he founded. Its modern name is Mainalo. Mons Maenalus was sacred to the god Pan who frequented it. Ovid in his Metamorphoses said that Mons Maenalus bristled with the lairs of wild beasts and was a favourite hunting ground of Diana and her entourage, including Callisto. In saying this, Ovid clearly rejected the story that Maenalus was Callisto’s grandson, as the mountain would not yet have got its name.